Although December was undeniably a painful month for equities, it’s almost like the steep correction never happened. The S&P 500 hasn’t yet reached the level it was at before the early-December crash, but the way things are looking now, the index could be close to it within the next few months - at least that’s what one firm is forecasting. In their weekly “Flow Show” report, Bank of America Merrill Lynch Chief Investment Strategist Michael Hartnett and the team said in general, positioning is still bearish, so they remain “tactically bullish on risk asset prices”. They expect the S&P 500 to reach 2,750 by the end of winter. Before it crashed in early December, the index was trading in the 2,790 range, and before the October crash, it was closer to 2,925. Even though there is still much more ground to make up, the stock picture is looking eerily similar to pre-October action. Tech stocks are back, with the exception of Netflix, which is crashing on the back of mixed earnings results. Apple, Microsoft, Amazon, Facebook, Alphabet and many other hot tech names are rallying again today. It looks like those who were hoping for the extreme imbalance between growth and value to be reduced will just have to keep waiting. The BofAML team also noticed something else about U.S. equities that’s particularly interesting. 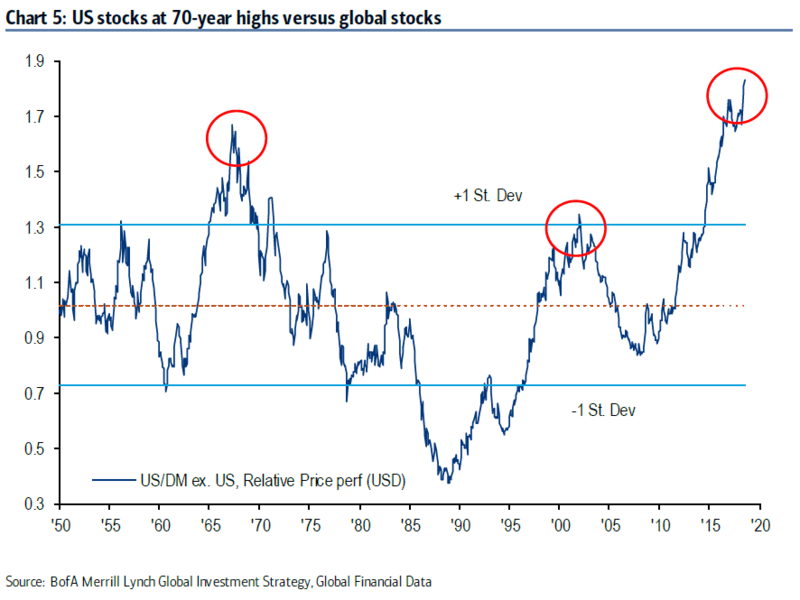 U.S. stocks are at their highest level versus global stocks in 70 years. However, they also said a “sustained rally” is waiting on an “unambiguous signal” from a number of earnings lead indicators. One is the Philadelphia Semiconductor Index, which they said should pass 1,400 to signal that tech isn’t in a bear market. Despite the rising prices, the BofAML team also reported that equity funds have recorded outflows in eight of the last nine weeks. Last week equity outflows reached $4.8 billion. U.S. equities saw massive outflows of $7.7 billion. Equity redemptions totaled $4.8 billion. The S&P will probably keep rising unless another big worry arises, especially if government stays open and the China trade wars ease or end.